Land Rover Military Discounts up to 15% for serving members of HM Forces. Land Rover. That's because we provide a variety of exciting UK based and VAT-free savings on all our products. Our forces discounts are available on everything from the iconic Defender to the legendary Range Rover. You've never been in a better position to make one of the finest, most capable vehicles in the world your own for less. 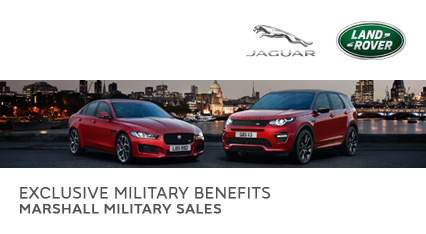 PLEASE REGISTER TO GAIN ACCESS TO OUR SPECIAL PRICES, this exclusive website offers military personnel savings on all new Land Rover vehicles. 5. Range Rover Sport with up to 7% military discount. 6. Range Rover with 10% military discount. Taking advantage of your status couldn't be easier. We have an experienced team ready to help you every step of the way – from choosing the right vehicle, to delivery and beyond. And with an International network keeping your Land Rover with you just won't be a problem. Every full-time, serving member of Her Majesty's Forces whether stationed in the UK, about to be posted overseas, or currently overseas are entitled to preferential prices on a new Land Rover. Defender, Discovery 4, Range Rover Sport or Range Rover, you're free to choose from the entire Land Rover Range – as well as being able to list a specification appropriate for the country of your current posting, or your next. The 'Marshall Military Sales' commitment is to put the needs of its customers first. Our dedicated delivery centre for Marshall Military Sales – centrally located in the UK with excellent road, rail and air connections. At our head office in Peterborough we have a dedicated team to swiftly and efficiently assist our customer in the purchase a new Land Rover. We understand our customer’s requirements and have wonderful knowledge of the market and protocols. For over 10 years we have specialised in Military Sales for Land Rover and pride ourselves on our large number of repeat customers. In Marshall Military Sales we are constantly supporting the relationships forged through affiliation – with, RAFA, Army Benevolent Association, and Forces Financial. Military ID required at time of order.